SEATTLE – Development of a universal flu vaccine, a treatment that could regenerate muscles and training to address racial bias are a few innovations that are one step closer to reaching the market thanks to the Commercialization Gap Fund (CGF) at Washington State University. Seven WSU faculty received support from the second round of CGF funding in January. The money helps researchers get innovations from the lab to the market. WSU and the Washington Research Foundation (WRF) established the CGF in 2014 to give researchers the boost they need to make it through the development/testing phase. “Supporting university innovators through this crucial stage is an important part of enhancing Washington’s entrepreneurial ecosystem,” said Beth Etscheid, director of research commercialization at WRF. The WRF provides support all along the innovation process, from attracting outstanding researchers to Washington, to investing in companies that spin out of nonprofit research institutions. WRF’s investments are directed to bringing forward innovations that will improve people’s lives and enhance the success of Washington’s technology based startup companies. 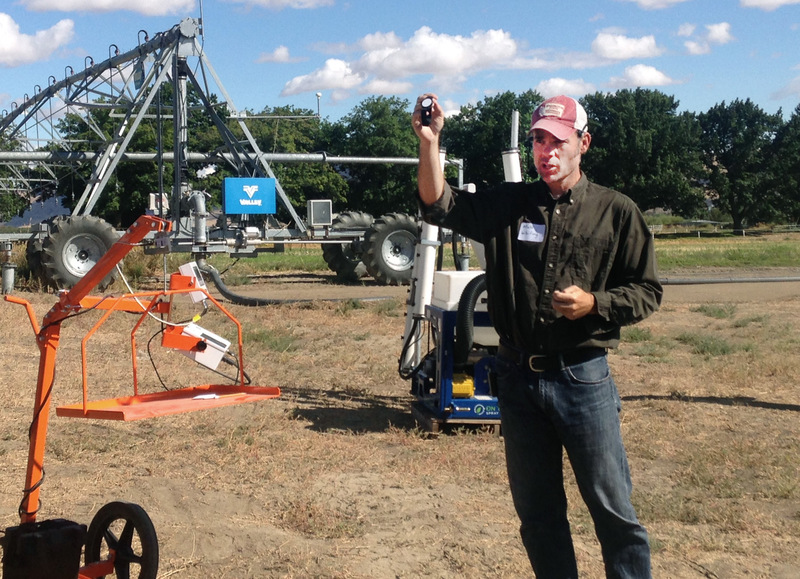 WSU’s Matt Whiting demonstrates his FairWeigh orchardist technology. WSU researcher Matt Whiting was in the first round of CGF grantees, and the support helped him fine-tune a FairWeigh system prototype that improves business operations for orchardists. Fairweigh ignited commercial interest, spurring the launch of Whiting’s company MYM LLC. Inc., co-founded with WSU alumni Mark DeKleine and Yiannis Ampatzidis. “We enjoy seeing the diversity of technologies from a wide range of disciplines that are supported by the gap fund,” Etscheid said. Santanu Bose, College of Veterinary Medicine. Development of broad-spectrum therapeutics for treating influenza A virus associated pneumonia. Boel Fransson, College of Veterinary Medicine. Veterinary assessment of laparoscopic skills. Lois James, College of Nursing. Counter bias training to repair broken police community relationships in the wake of racially charged officer-involved shootings. Jacob W Leachman, Voiland College of Engineering and Architecture. Purification of hydrogen from waste biogas streams for liquefaction and dispensing via the WSU hydrogen fueling station. Matthew McCluskey, College of Arts and Sciences. Confocal optical profile microscopy: An inexpensive system for 3D scanning. Dan Rodgers, College of Agricultural, Human and Natural Resource Sciences. Actriiex, a novel gene therapeutic for treating cancer cachexia. Yuehe Lin, Voiland College of Engineering and Architecture. Universal technology for disease diagnosis based on a portable personal glucose meter. The CGF is one part of WSU’s increased support of researcher’s efforts to translate research into products and services that benefit the public. Recently WSU also launched the Entrepreneurial Faculty Ambassadors, a peer-to-peer mentoring network that matches seasoned faculty entrepreneurs with those still learning the process. Another new resource is the I-Corps Site grant, which focuses on increasing student and faculty participation in entrepreneurial endeavors. The gap fund is made possible thanks to a collaborative investment from the WSU offices of the president, provost, vice president of research, commercialization and the WRF.